When you think about the need for life insurance, most people will typically consider those who are younger requiring protection of lost income for children and spouses, or the need to cover debts such as a mortgage balance. In fact, there are some who may feel that by the time you reach your 70s, the need for life insurance coverage is slim to none. The truth is, though, that there are a number of reasons why someone in their 70s would still need the financial protection that life insurance can offer. For instance, regardless of age, when the time of passing comes, most people will have at least some amount of final expenses - and today, the cost of the average funeral and related costs can run in excess of $10,000. This is especially true when factoring in a person's burial plot, headstone, flowers, transportation, and obituary notices. While many loved ones may not have this amount of money readily available for paying final expenses, having life insurance coverage can provide cash for quickly paying them off. This can allow the family to forgo having to dip into savings or other assets - or worse, having to put these expenses on credit, which could essentially cause long-term financial hardship. 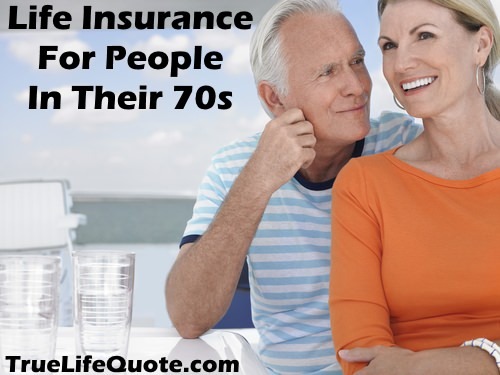 Those who are in their 70s may also require life insurance protection for other reasons, too. For instance, in the past, many who were considered seniors may have had their mortgage and other large expenses long paid off. These days, though, things are vastly different. Due to our longer life expectancies, people are much more active - meaning that homes are still being purchased later in life, as are autos and boats. All of these items can come with long term payment plans - which, should the unexpected occur, could leave a spouse or other loved ones with a large amount of debt to pay off. A life insurance policy could help with this large debt, and not put loved ones in a bind. For those who have a spouse or a partner who are counting on shared pension or retirement income, there could be reason to believe that their lives would be turned upside down, too, should the unthinkable occur. This is because in many cases, when the primary pension recipient dies, some - or all - of the pension income may stop. This could leave the secondary recipient without a large portion of what they need to live on for the remainder of his or her life. By having life insurance proceeds to rely on, though, the surviving spouse or partner could easily replace that lost income and continue on, without the need to drastically reduce their lifestyle. When you're in your 70s, there are several types of life insurance that you may be able to choose from. Certainly, the life insurance company will want to know as much as possible regarding your age and health condition - depending upon the type and amount of coverage that you choose. If you opt to go with "traditionally underwritten" coverage, there is either term or permanent protection. Term life insurance will offer death benefit protection only, with no amount of cash value build up. With this type of coverage, your protection will last for a certain number of years, and then it will expire. Depending on your actual age and health condition at the time you apply for coverage, you may be able to obtain a longer time period for your coverage. You may also be provided with the option to "convert" your term life insurance over to a permanent life insurance policy within a certain period of time. Permanent life insurance provides death benefit protection, along with a cash value component. This means that, along with your life insurance coverage, these policies will also have a savings feature. This savings provides some tax advantages in that there will be no taxes due on the growth of the funds within the cash component unless or until they are withdrawn. You may use these funds for paying off debt, or even to help you with supplementing your retirement income if you choose to do so. If you choose to go with a life insurance policy that is traditionally, or medically, underwritten, it means that you will need to undergo a paramedical exam in addition to completing the application for coverage. The paramedical exam, or "paramed," simply consists of meeting with a medical professional - typically in your home or other convenient location - and having them take a heart rate and blood pressure reading. You will also be required to submit a blood and a urine sample, which will be tested for various health related conditions. Should it be determined that you are in good health by the insurance underwriters, then it is likely that your coverage will be approved either as a Preferred (if your health is considered excellent), Standard (if your health is considered to be average), or Substandard (if you have certain health issues that are not serious). Should you opt not to go with a medically underwritten life insurance policy, there are other options for you to choose. Some of these options may be a better route for you - especially if you have certain health related issues. For example, a no medical exam policy - as its name implies - does not require an applicant to undergo the paramedical exam. Therefore, an applicant is typically guaranteed to be approved, provided that the premium continues to be paid. It is important to note that, because the applicants for no medical exam life insurance policies are more "risky" to the insurance carrier, the premiums that are charged are usually higher. These plans can, however, be a good way to obtain the life insurance protection that you need. Another good option for finding life insurance for people in their 70s is final expense life insurance coverage. These policies, oftentimes also referred to as either burial insurance or funeral insurance, are typically purchased for the purpose of paying for someone's funeral and other related expenses. These policies will usually have a face amount of between $5,000 and $50,000 - so they can easily cover most of the needed expenses, as well as possibly other costs such as uninsured final medical bills. The cost of life insurance for those who are in their 70s will vary a great deal, depending on several factors. These will include your age and gender, as well as the type and the amount of life insurance coverage that you purchase. The good news is that, given today's longer life expectancies, the cost of life insurance has come down - in some cases, considerably - for those who are in their 50s, 60s, 70s, and 80s. This is because the risk of paying out claims to the insurance companies is getting lower. If you purchase a traditionally underwritten policy and you are deemed as a Standard policy class, then your cost will typically be in line with other policyholders who are also in their 70s and who are of average health, height, and weight. However, if you are placed as a high risk policyholder, then your cost will be somewhat higher. For those who purchase a final expense life insurance policy in their 70s, the cost may be somewhat lower. One reason for this is because the face amount of these particular policies is usually less than many other types of life insurance. If you are shopping for senior life insurance and you're in your 70s, then it is usually best to work with either a company or an insurance agency that has access to more than just one life insurance carrier. This way, you will be able to compare different policies, benefits, and premium quotes - and from there you can determine which one is the best for you and your personal situation. Many people may not realize that life insurers all price their products differently - therefore; you may be charged a different price from one insurer to another, even for the very same amount and type of policy. When you are ready to shop for your coverage, we can help. We work with many of the top life insurers in the industry, and we can assist you in obtaining all of the important details that you need. If you're ready to move forward, just fill out the form on this page. Should you have any additional questions as you shop, we can be reached directly via phone, so please feel free to call us. You can dial us, toll-free, at 877-235-9299. We understand that the process of shopping for life insurance when you're in your 70s may be a bit daunting. But the good news is that you have an ally on your side. So, contact us today - we're here to help.